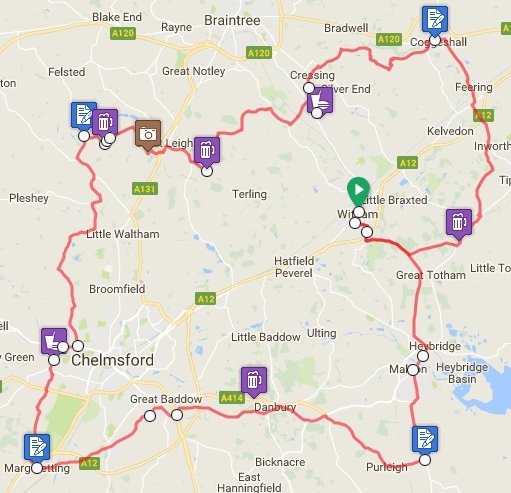 105km cycling event starting from Witham. Controls at Coggeshall, plus 4 information controls. The fourth of ACME's Winter 100k Brevet Series. A themed 105k tour of Knights Templar related locations. Again, an opportunity to ECE for some winter points. Ridden all 4 in the Winter Series? Collect a shiny! The official start & arrivee is The Battesford Court Wetherspoons pub in Newland Street, good location for breakfast before and post ride refreshments. Early lunch or warming tea/coffee & cake at the the Lordship Tea Room in Writtle. Visit the ACME spiritual home for a huffer lunch at The Compasses in Littley Green. Call in to the Cressing Temple Barns for afternoon cake, a location heavily steeped in Knights Templar legend. Passing a Square & Compasses, narrowly missing a second Compasses and passing a third gives a full house of compasses pubs on this Essex Mystery tour. There will be car parking available at The Labour Hall, Collingwood Road CM8 2EE. Frequent train services from London and Norwich/Ipswich/Colchester can also get you to Witham with minimum fuss, directions to the start less than 5 minutes away by bike will be provided in the info sheet. **Check railway engineering works** Instant validation of your brevet at Arriv�e.